The original 1999 clamshell iBook is arguably the most aesthetically striking notebook computer form factor Apple ever built - the only challengers would be the MacBook Air and the unibody family, but the clamshell iBook is a very strong contender with its bright, two-tone livery, voluptuously rounded contours, and built-in carry handle. Not that everyone liked the clamshell - veteran ZDNet commentator John Dvorak, never one to hold back, dismissed it as a "girly machine", "effeminate", and "Barbie's laptop". Others thought it looked like a giant makeup compact, while still others suggested that when open it had an alarming resemblance to a toilet seat. However, for some of us who weren't initially taken the iBook's radical design, it grew on us over time. I think the iBook has aged rather gracefully, not seeming old-fashioned even more than 10 years on. 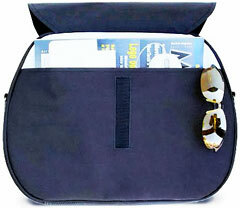 The clamshell was offered in five different colors over its roughly 20 months in production. In chronological order of appearance: Blueberry, Tangerine, Graphite, Indigo, and Key Lime, the latter sold only through the online Apple stores. It was my personal favorite, with Graphite being the runner-up. 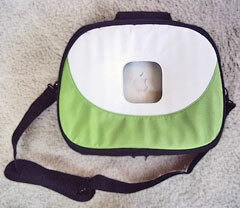 Of course, some folks liked the original iBook's look from the get-go, including the MacCase folks, who came out with an Apple-specific laptop case inspired by the iBook's design and colors came back in 1999. They've resurrected it in updated form for a new generation of Apple 'Books in response to requests from MacBook and iBook owners - a retro revival that I suspect may appeal to many Low End Mac readers. 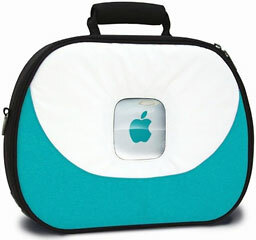 The Classic Case is a near match of the original, sporting the rounded shape of the clamshell iBook, a choice of all five colors, and a 1999-esque price tag of under $50. "We created the market for Apple laptop cases in 1999 with the launch of the first briefcase for the clamshell iBook," says Michael Santoro, MacCase's President and CEO. "Despite the unorthodox design, the case was extremely popular. It actually became the de facto solution for the iBook." "Demand for the case was high, but Apple kept developing new products, and so did we," Santoro continues. We had no plans to continue the case after it sold out, but requests continued and then escalated with the launch of the 13" MacBook. The unique design really taps into the 'anti-status quo' element within the Apple community. We are happy to continue being a part of that. "While we did not change the basic shape, we did improve the original with details like molded rubber corner protectors and an air mesh interior floor that allows the processor to cool after use, and fully structured side walls offering greater protection from bumps and falls. Features like our signature logo window and two-tone front face remain." The updated and reintroduced MacCase Classic case fits both families of 13" MacBook plus the 13" MacBook Pro, and also can nicely accommodate 12" dual-USB iBooks and 12" PowerBooks. Our test unit arrived in my favorite Key Lime front panel color. The rest of the case is black, inside and out, save for the inner panel of the full-width back pocket, which has a flap-closure secured with Velcro and can accommodate papers, file folders, magazines, and small peripherals, cables, and the like. Inside, the case is generously padded on all sides, top, and bottom, and two Velcro-closure nylon straps hold the computer securely in place. As Mr. Santoro notes, the padded bottom panel is faced with a mesh fabric to aid in cooling the computer, while the sides and some 3/5 of the top panel start of a soft plush fabric (the other 2/5 is faced with nylon taffeta fabric). The top/front panel has a double-zipper closure that unzips about 270° to provide completely unimpeded access to the internal compartment. There is also a double pocket on its inner face that can be used to carry cords, cables, other small incidentals, and perhaps even a small mouse. The clear plastic window in the center of the panel allows the Apple logo on the computer's lid to show through to the outside world when in situ. The MacCase Classic's inner padding, internally structured side walls, and molded rubber corner protectors provide an extra layer of protection, and there's textured, waterproof nylon armoring on the bottom of the case. 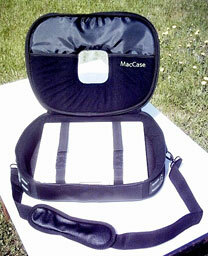 The MacCase Classic has a briefcase-style handle with a generously dimensioned soft rubber grip for comfort, and there is also can adjustable nylon mesh shoulder strap with a comfort shoulder-pad faced with non-slip "traction" material, that attaches to the case with substantial, metal, quick-release swivel connectors. 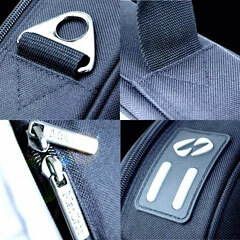 The main closure zippers also have metal pull-tabs. It bears noting that I'm very favorably impressed with the high quality of materials, workmanship, and hardware in the MacCase Classic case - extraordinarily good on all counts - and the case carries a lifetime warranty. 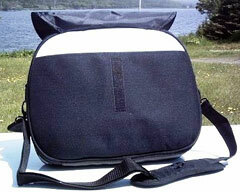 This computer bag looks great (at least if you like the clamshell iBook look and color themes), offers excellent protection for your 'Book in a compact, lightweight package, and is reasonably priced. Its only real shortcoming is a lack of storage capacity for peripherals and other extras, but that's more an observation than a criticism, since providing that capacity would make the case bigger and heavier. Also, MacCase will add a matching (in your choice of black or white) accessory pouch for an extra $10, which addresses that issue. As it is, I think a good balance has been struck between size and capacity with this case for its intended purpose, which is transporting and protecting your laptop in an elegant, pleasant-to-carry unit rather than carrying a portable office with you. 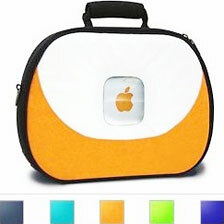 The case comes in the five traditional clamshell iBook colors (Tangerine, Blueberry, Key Lime, Indigo and Graphite). 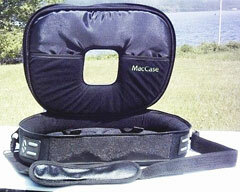 MacCase products are available at mac-case.com, MacMall, Small Dog Electronics, Mac Connection, and Amazon.com.